Since his first film in 1985 (Alpheus), Menelaos Karamaghiolis (b. 1962) constructed an atypical oeuvre that vacillates between documentary and fictional cinema. This summer, after the strong impression made by the screening of ROM (1989) at the Cinémathèque Française, as a part of « Romani Cinema », a program section for the avant-garde sessions, we started to exchange a lot through emails and by phone. Firstly, ROM struck us (Nicole Brenez and myself) as a rare pearl of this cinema confronting the history of the control, the genocide and the visual sovereignty of Romani families (Roma, Manush, Gitanos, Gypsies, Travellers, Sinti, Zingari). By talking with Menelaos Karamaghiolis, I realized that the singularity and the importance of ROM exceed the field of this « Romani Cinema ». The life of the film – from its shooting until the different incident and the happy coincidence of its distribution – is a condensed of the history of Greek documentary films and shows how the form of a film may confront both the figurative conventions and the narratives shared in the public space. The constant improvisations that marked the shooting and the editing of ROM was in a certain way a real field of experimentation for Menelaos Karamaghiolis. These were the reasons why we asked Menelaos Karamaghiolis if we could put online a long extract of his film. He generously responded that he could give us the complete version with english and french subtitles, because « he likes films to be open and free to everyone, especially the ones with strong social interest about sensitive populations in a era where we are surrounded by a new strong wave of racism and prejudices against populations like Romani people ». The short interview that follows introduces the Internet première of the film, and concludes in a way the program section “Romani Cinema”. It is only a part of a long conversation we had about ROM, the situation of Greek Romani and the practice of documentary films. Débordements : Could you tell us about the genesis of the film, how the idea of the film came up, and how you found the funds to make the film ? Menelaos Karamaghiolis : It was a period in Greece (1988), when documentaries could only be made through the Hellenic Radio and Television (ERT – the former Hellenic Broadcasting Corporation). Usually they had to give us the subject, and they didn’t at all want to produce a film about Greek Romani, which was a sensitive subject. But at that time, the director of the ERT knew me very well because of a previous film I made on the island of Lesbos, where he was President of the Regional Council. So he asked me for a documentary about Greece and Europe. I said I would do it if I could go on with the documentary on Greek Romani that ERT had refused me for years. He gave me the permission. So we started to shoot the film in my city, Thebes, near Athens, where you could see Romani everywhere. They stayed in camps at the entrance of the city, working in agriculture, and other jobs like that. Until the 1980’s, they were a necessary element of a city. But 1989 was the last year that Romani had camps like that, and had this relationship with the Greek population. Starting from 1989 everything changed. So we started doing the film, without enough money and the ability to go further, in other places or other locations in Greece. D. : You said in the brief summary you sent me that it was the first time we used the term Rom for “Gypsies”. Did you mean in the history of cinema or more broadly in the public space in Greece ? M.K. : In the public space, and by Gypsies themselves. They didn’t know it. When I finished that film, it was just a TV documentary, to roll after the news. But suddenly, the film was screened at the 1989 Thessaloniki Film Festival (at that time, the Greek Film Festival, the only film festival in Greece). After the screening, the audience was up for twenty minutes, clapping. We won a few prizes (“Best Documentary” and “Best Film Editing”). After that, the film was at some other festivals like Cinéma du reel (1990), or IDFA (1991). When the Union decided to screen the film, after Thessaloniki, there were so many people outside the theatre that they had to do two screenings. Without any advertisement or anything, only by rumour, the theatre was full. […] And that film had a career by itself, made only by word of mouth, ERT didn’t even pay to translate a copy for abroad. The film’s career continues, and the final step is what you did at the Cinémathèque Française. It wasn’t shown anymore, and suddenly, because of your screening, there were two very successful screenings at the Greek Cinémathèque, for the first time, and there are some other screenings in the next few weeks in Thessaloniki. It is a second career, thanks to you and Nicole Brenez. D. : You also said that the ERT censured the film. Can you describe how they intervened ? M.K. : Yes, the ERT exercised a sort of censorship on the film at a time when documentaries were underestimated in Greece. A person from the ERT came and said : “We’re the producer and we need to see the film before its completion”. After she saw it, she said : “The film cannot be like that, we have to cut all the interviews of the Romani where they are asking for schools, assistance, justice, goods”. We also had to cut a fairy tale of Roma and a song that was very popular at that time, a Roma was singing that “Madonna is looking at me in tears”… and the ERT didn’t accept it either. But they didn’t realize that I was faking a lot about what is Greek and what is not Greek, because, you know, we had (and we still have) these very dangerous discourses about what is Greek, what we inherit from the ancient Greek. Of course we speak the same language but first we need to learn what the ancient Greek civilisation was, and then say if we are or aren’t the continuity of that. But, even during the Byzantine Empire, Greece didn’t exist as a country. It is a country that is two centuries old. This is the reason why I made the game with two Roma boys wearing Greek national costumes during a photo shoot. For me, this is the scandal of the film… that no one had noticed. 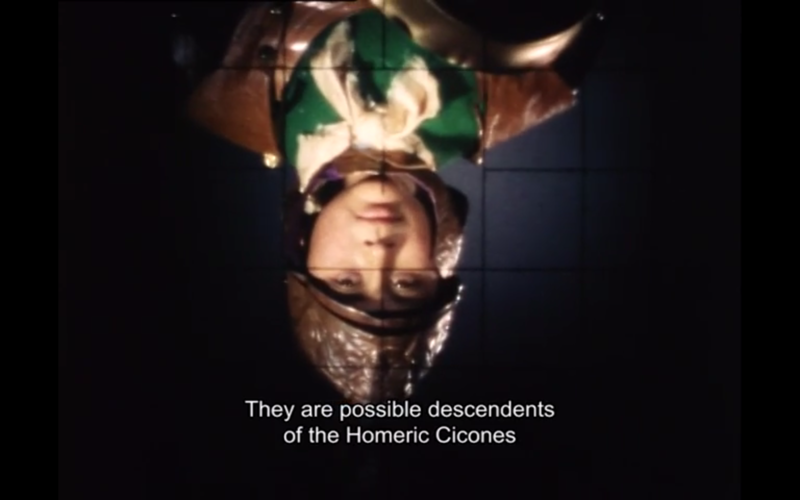 If the film was made today, with Golden Dawn [Aube Dorée], they could ban the film. You have two Roma dressed as what we think represents the epitome of the Greek national identity. D. : About the images of the pilgrimage in Tinos, I wondered how you made the shooting and the editing, because the images show popes, and militaries, probably politicians and the voices are talking about the persecution of Romani people by different authorities. And, as Nicole Brenez pointed out, this poetic fresco, made through the détournement of the document (for instance, the postcards of bare breasted women are more from the Maghreb right ?) is particularly unique in the history of Romani Cinema. M.K. : I understand what you’re saying. Yes, I made the images of the pilgrimage. I went twice, two different years, one time alone, with a small camera, and the second time with a small crew. In Greece, August 15th is like the Easter of the summer. One hundred and something years ago, they found an icon of Madonna in Tinos Island. It did some miracles, and since, it has become a place like Santiago de Compostela. The Romani in Greece have a strong relationship with Madonna, so, in the 1970’s they started to go to Tinos Island every year. Today, you can see Romani in their sleeping bags everywhere around the church. But at that time, they were not allowed to enter into the church, so they had to cross the line of soldiers… and I was trying to film, and it was very difficult because the soldiers were also trying to stop me. Even some priests put their bodies in front of the camera. These frictions were very interesting. But despite this, the Romani decided to go there every year and they believed in it, they spent money ; it is their celebration of the year. Because of that, they do all the necessary things like going from the sea to the church on their knees, they participate in this litany in a very passionate way. And they are ill, they have problems, so they go there in order to feel better, because they don’t trust the doctors or they don’t have access to the hospital. In that litany you can find everything, as you said, the army, the priests, Madonna, the passionate way, the memories. However, it is interesting to note that Greece was the only place where the Romani were not persecuted, for all the centuries they were here. Especially, during WWII, the Greeks helped them in order to not go to the Nazi camps. They hid them and supported them. Now, it is totally different. Everything has changed in the last twenty years. In the juvenile prison where I did a documentary in 2012 , 90% of the boys are Roma. D. : And how did you proceed to construct this narration with four different voices ? K.M. : Every solution in Greek cinematography results from difficulties. It was very difficult to proceed on the editing of the film at that time. It was impossible to see what you had shot and it was very expensive to edit on the Moviola. So I had to create a script or something to help the editor. And I found the solution with these four heroes, all of them based on real people I met during the shooting of the film. I had to be very clear about what was important for me in that film. We have to know the history of the Romani, that is the role of the teacher. Then, we need to know about their fairy-tales, so we need an old Romani woman (Tamara). Then, we need our point of view ; this is the photographer who goes there to shoot them. And, we need their own voice describing what is the reality today. That voice is a young girl (Aima), a Romani who doesn’t say that she’s Roma. At the end, her character accuses the photographer – she accuses me and my crew ! And I liked that, because I felt very guilty a lot of the time, shooting them, talking with them, I was wondering : “What are you doing there ? You’re making your film and after that you’ll go in your house”. Interview made via Skype the 09 / 29 / 2016. Menelaos Karamaghiolis wrote and directed the documentary television Series Meeting with Remarkable People (2011–2016). Among the 24 films, The Return (2015, video, 72’) describes how theatre can become a means of education and reintegration for a group of underage prisoners.